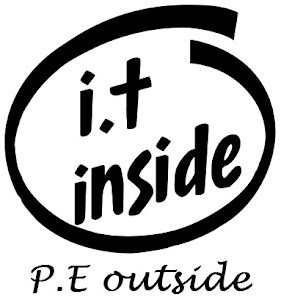 I.T Inside P.E Outside: Welcome! Welcome to I.T inside, P.E outside!! This blog has been set up to tackle all the tech related ideas that are possible when it comes to engaging students with the learning process and then connecting those ideas with the Physical Education classroom in mind. I've set this blog up in the hope that it will assist my fellow PE super stars out there, as well as providing a handy resource for myself to refer back to from time to time. So a little about me. I'm a P.E teacher in a secondary college in Melbourne, Australia. I've been teaching since 2007 and I have a love for gadgets, games and sport in general. My sport of choice is golf and have been moderately successful in that sport since I was 9 years old. I'm a passionate Sydney Swans supporter and I love Olympic years. - I.T + SEPEP = EPIC! It's as easy as a click and a snap!